Despite Better U.S.-Cuba Relations, Guantanamo Set To Stay In U.S. Hands : Parallels The U.S. has controlled the naval base for more than a century and sends Cuba an annual rent check of just over $4,000. And each year since the Castros took over, the Cubans have refused to cash it. 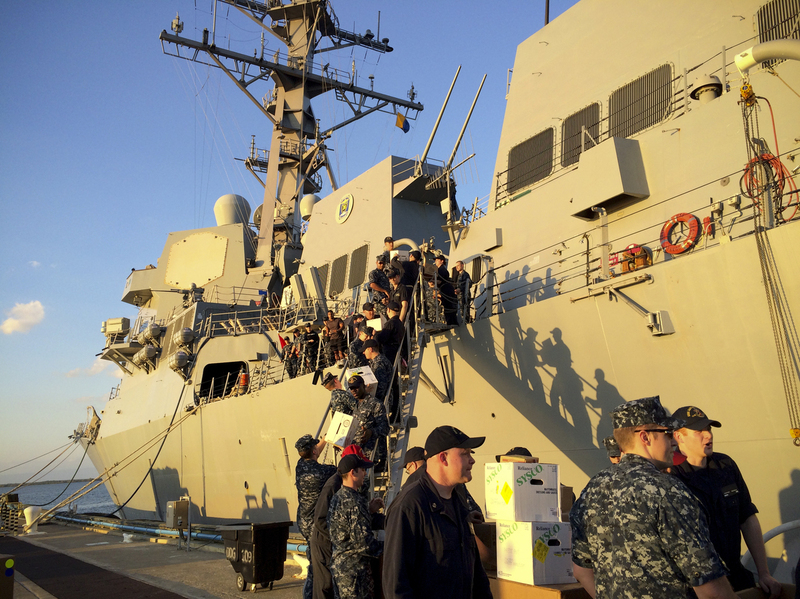 Crew members of the U.S. Navy destroyer USS Jason Dunham load supplies while docked in Guantanamo Bay, Cuba, earlier this year. The U.S. and Cuba have restored diplomatic relations, but the U.S. says it remains committed to keeping the base. Guantanamo Bay — at least officially — is still part of the "Pearl of the Antilles," as the Caribbean's largest island is known. But Cuban officials are nowhere to be seen when flights from the U.S. land at the naval base. Americans who arrive at the airstrip alongside the bay have to show their passports, and the officials checking those passports are with the U.S. Navy. The United States has controlled Guantanamo Bay since the end of the Spanish-American war in 1898. The American forces that joined Cubans during the final months of the struggle for independence from Spain installed a U.S. military governor after the defeat of the Spanish. Under the terms of the so-called 1901 Platt Amendment the U.S. obtained the right to lease Guantanamo Bay for a coaling and naval station, with an annual payment at the time set at $2,000 worth of gold coins. That payment was doubled in the 1934 treaty, and to this day remains at $4,087 a year — although Cuba has refused to cash the American rent check since shortly after Fidel Castro seized power in 1959. 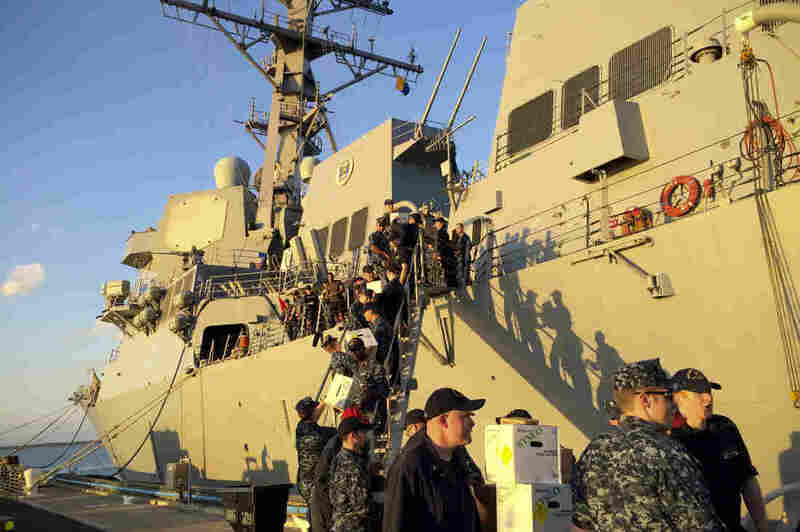 The naval station's original rationale, as a strategic port for U.S. warships to refuel and resupply, has waned. When the Navy destroyer USS Jason Dunham docked there on its way to the Baltic Sea earlier this year, it was only the third ship to do so in six months. "She's an amazing warship," says Cmdr. Darren Dugan, commanding officer of this guided-missile destroyer equipped with an advanced Aegis radar system and Tomahawk missiles. Dugan says he's happy to be making the port call, even though he finds it easier to refuel at sea. "Guantanamo Bay is great," he says. "It gives us the ability to refuel, get maintenance done, [and] the crew enjoys some time ashore." Among the base's attractions: an outdoor movie theater with free admission. As he settles in for a screening there of American Sniper, Carl Davis says the base is a great place for civilians as well. For him, it's a hometown. "My father was in the Navy here, and me and my twin brother were born here," says Davis. The 50-year-old assistant fire chief considers the base a kind of Mayberry, USA — with iguanas. And he does not think the U.S. should or will relinquish the installation. "I think it would be a good loss for a lot of the military folks," says Davis, "because getting stationed in Guantanamo is really a hidden gem of a duty assignment for the active duty folks." 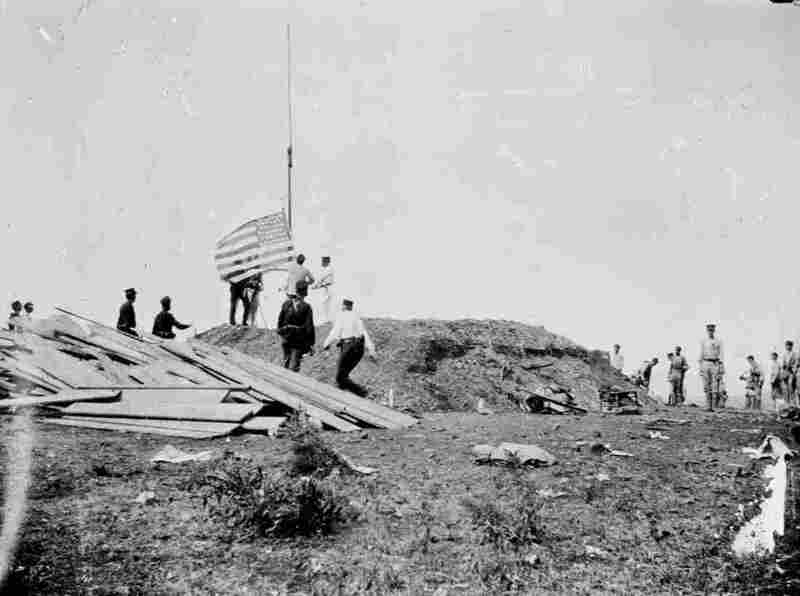 1es Regiment, U.S. Marines Camp, Deer Point, Guantanamo Bay, Cuba, April 26, 1911. Indeed, many in the military are determined to keep it open indefinitely. "Guantanamo Naval Base is a hugely useful facility to the United States," Marine Corps Gen. John Kelly told reporters at the Pentagon earlier this year. Kelly, who heads the U.S. Southern Command in Florida and oversees Guantanamo, acknowledged that President Obama wants to close Guantanamo's prison camp, which currently holds 116 war captives. But Kelly said the base would still be needed for dealing with refugees from nearby Haiti and elsewhere who are picked up at sea. "We construct camps, temporary camps, treat them right, feed them, you know, take care of them in the way that, you know, the U.N. particularly has got guidelines for refugees," said Kelly. "And then we assist the [Department of Homeland Services] in repatriating them. So it's a very useful base." Some say it's too useful, and not always in a good way. Miami-based immigration lawyer Ira Kurzban accuses U.S. officials of using Guantanamo to skirt the law. "What is the purpose of taking people to Guantanamo?" Kurzban asks. "It's to keep people who are seeking asylum and who may have genuine claims for asylum out of the United States, so they can't assert those claims." Others who know Guantanamo well question whether the benefits for the U.S. of remaining at the outpost outweigh the costs. "It has significant strategic value," says retired Navy Adm. James Stavridis, who was in charge of the U.S. Southern Command from 2006 to 2009 and is now dean of the Fletcher School at Tufts University. "But I wouldn't describe it as vital to the national security needs of the United States." The U.S. occupation of Guantanamo is still a sore subject for Cuba, despite the recent restoration of diplomatic ties between the two countries. Last month, on the day the American Embassy in Havana reopened, Cuba's foreign minister, Bruno Rodriguez, demanded "the return of the territory occupied illegally by the Guantanamo Naval Base." Standing alongside Rodriguez, Secretary of State John Kerry was not making any promises. 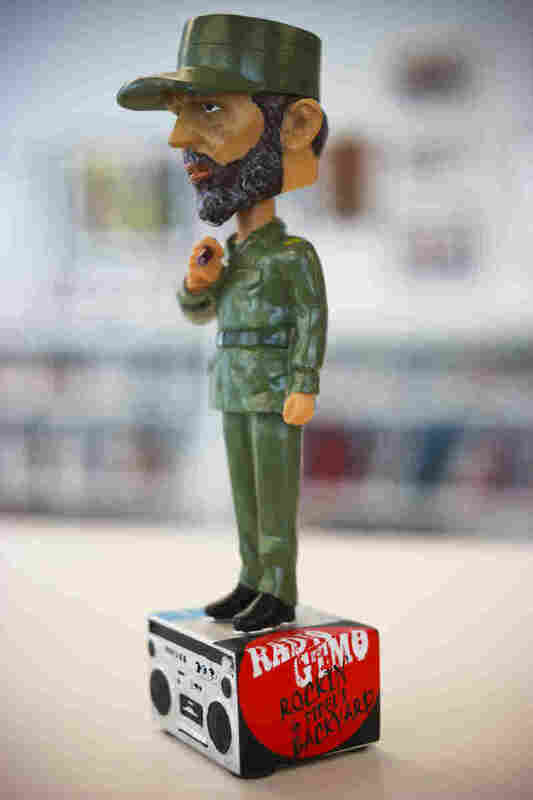 "At the moment," Kerry told reporters in Havana, "there is no current discussion or plan to change the arrangement with respect to Guantanamo." For the time being, the only sign of Cuba at the naval base is radio broadcasts from Havana boasting of the Cuban revolution enduring into its 57th year. Cubans no longer work at Guantanamo — they've been replaced by Jamaicans and Filipinos who are paid half the wages Americans are offered for the same jobs. At The Jerk House, a Jamaican-style base restaurant, an American civilian named Bill Condon says he moved to Guantanamo two years ago with his wife, a Navy official who works at the base hospital. Condon senses that Cubans resent the U.S. presence on their island, and he says they may have a point. "I don't think they're going to let us forget about the fact that they want this base back," Condon says. "I don't think this is going to continue on forever." If the 1934 perpetual lease treaty were to be terminated, one of two things would have to happen. Either the U.S. would have to abandon the base, or both countries would have to mutually agree to a pullout — similar to what happened in the 1977 Panama Canal Treaty under which the U.S. relinquished control of the Canal Zone in 2000 to Panama. Former Southcom commander Stavridis sees a similar future for Guantanamo, but not until relations with Cuba get warmer and the war captives prison is shut down. "To have the negotiation before we have a clear path to closing the detention facility," says Stavridis, "will be an exercise in futility for both sides." In the meantime, with a GOP-led Congress resisting efforts to close that facility, the U.S. will likely keep sending Havana its annual Guantanamo $4,087 rent check. And Cuba, no doubt, will keep refusing to cash it.